The American diet is known to be high in saturated fats. Not so in Italy. Olive oil rules the day. Olive oil is a monounsaturated fat (one double bond, whereas polyunsaturated oils have more than one double bone… for those interested). Between the olive oil (served with lunch and dinner), a glass of red wine ( lots of antioxidants to help regulate cholesterol levels) and many great spices, from garlic to basal to sage and rosemary, what has become known as the “Mediterranean diet” is renowned for decreasing the risk of coronary heart disease. Here are some interesting facts we learned about olive oil while here in the Tuscany region: Olives are generally harvested in the fall (FYI the drought here has taken its toll on the olives). Once collected, they are pressed immediately for their oil. Virgin olive oil is pressed a cool temperature. The reason being: heat and light make oils go rancid (aside from not tasting good, rancid oils can act like free radicals and destroy cell membranes, RNA, DNA and mitochondria— Not good!). Virgin olive oil must have a low pH; with a higher the pH, it gets a different classification. A bottle of olive oil should be kept in a dark place, (not over the stove, and from what we learned, no Italians keep it in the fridge where it solidifies). The best containers are tin or dark glass, to keep the light out, and we were told on our tour that a good bottle has a years’ shelf life …at most! (Check your kitchen). As a side note, I am convinced that a BIG part of the Mediterranean diet, never discussed, is eating with friends and family. Support groups certainly affect one’s health status, and no Italians eat alone! 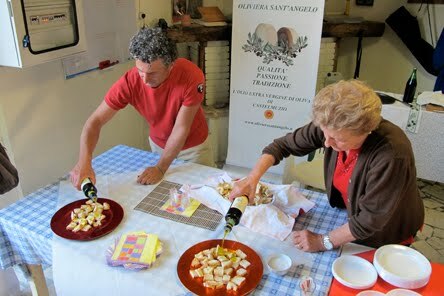 I am writing this blog entry from our Spirit of Tuscany tour (more about that later), and the other day we took a tour through an olive oil pressing plant (pictured above) where, after the tour of the plant, we were invited to sample the oil… We also went to a winery and everyone was invited to sample the wine, but that’s a different story. Simply fascinating… Enjoy….Ciao! Under A Tuscan Sun: Lessons on life from Italy! Greetings from Tuscany! 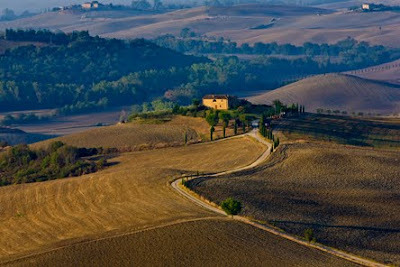 Today’s blog entry comes to you from Pienza, Italy; a land where people really know how to live! And manage stress. The pace of life here is comfortable. People don’t know the meaning of the world “rush.” They embrace life through the five senses: the aromas, the music, the artwork, the cool autumn breezes, and the food. Did I mention the food? Fresh tomato sauce. Basal picked fresh out of the garden. Pasta (gluten free, even) in a delicious cheese sauce, virgin olive oil spread on top and tiramisu for desert. People walk everywhere. They look into their friend’s eyes when conversing and everyone greets you hello. There is even romance in the air for those inclined in this direction. Life is bigger than life, and that is how life is supposed to be. Follow some advice from the Tuscans… relax! Cook a meal from scratch tonight. Enjoy the company of friends this afternoon. Chew your food slowly and savor each taste. Listen to some Vivaldi, Corelli, Scarlatti or Andrea Bocelli. Go for a sunset walk. Enjoy a gelato. Enjoy the good life, no matter where you are! Life is too short to worry or fret. Enjoy, enjoy, enjoy! There are scores of movies to add to the Tuscan ambiance including the most renown: Under a Tuscan Sun. But don’t stop there: Enchanted April or A Room With a View are also great movies. It may be iconic, but hey, that’s why people come to Tuscany… the land of icons, from Florence to Siena. This photo was taken earlier today moments after sunrise from my hotel room…. Enjoy! If you have ever tried to keep up with all the daily postings on Facebook, if you have ever tried to surf the internet and find yourself getting sucked into the vast web of content, if you have ever tried to scan all the cable TV channels looking for something good to watch, then you are well aware that indeed, we are headstrong into “the information age.” There is a line in the Jefferson Airplane song, Go Ask Alice, stating: “Feed your head”, and while it didn’t refer to digesting information, there really is no difference in the feeding process. Don’t stuff yourself! Experts in the field of stress management say with great regularity these days that our brains (while quite extraordinary) were not designed (or even capable) of the incredible sensory bombardment of information that we are exposed to today. At the same time, spiritual luminaries remind us of the importance of meditation, which simply defined means this: “increased concentration which leads to increased awareness.” A regular practice of meditation helps clear the head of superfluous details and ego chitter-chatter (distractions) so that we can begin to focus on what really matters, rather than become distracted by all the information eye-candy on the information superhighway. Meditation is not a religion. Meditation is simply a healthy behavior for mental clarity. So.. it’s time to meditate. Find a quiet spot to sit or lay down, close your eyes and focus on your breathing. If you get bored doing this, know that boredom is part of the meditation process. If your mind wanders (as it surely will), direct your thoughts back to your breathing solely on your breathing. Start off with 5 minutes and work your way up to 10 minutes, then 15 minutes after a few weeks until it become routine: second nature. Meditation should become as regular as taking a shower or brushing your teeth everyday. The benefits of meditation are many, from increased attention span and quality of sleep to an improved immune system and lower resting heart rate and blood pressure. It’s time to meditate! There are scores of books and websites on meditation, and since meditation is incorporated into nearly every religion, most websites have a religious inference (meditation is not a religion, if someone says otherwise…run!) While working with Olympic Athletes years ago, we called exercises in sport psychology mental training, of which meditation is a part. A great book on meditation (mindfulness meditation) is Peace is Every Step by Thich Nat Hahn. There are also several daily meditation books, with a meditation thought per day (my favorites are The Promise of a New Day and 356 Tao). 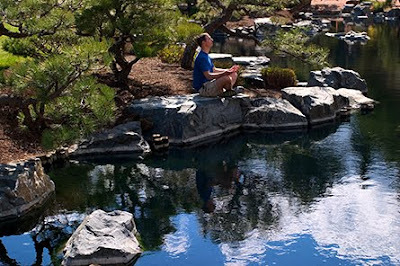 One day while doing some photography at the Denver Botanical Gardens, I saw a man meditating and thought it would make a great photo… Enjoy! What does success mean for you? Is a goal to achieve, as state of mind to behold? Or is it merely a state of mind, a feeling of contentment. Today the stress tip is to honor your successes in life. Rather than worrying about what may be, take a deep breath and enjoy what you have, the things you take for granted. Being successful means recognizing that you are a beautiful soul regardless of what anyone else thinks. 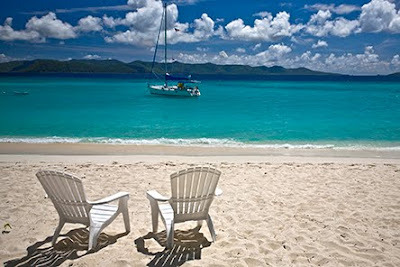 Sometimes success is simply enjoying vacation time, in this case, a secluded beach in the Virgin Islands… Enjoy! What is your relationship with your body? Do you view it as a temple… or a convenient store? Are you what you eat? Do you feed your head with negative news and junk food entertainment? Does your temple need a good sweeping with a broom (perhaps a shovel)? Consider the concept of the fast today, but not as missing calories or news content, but as a way to cleanse the temple of your body-mind. In doing so, take comfort in the emptiness where the divine resides within. Honor your temple! many, I decided to include the link here. Enjoy! The Earth (by extension) is also a temple, and although the entire planet is sacred, many places are considered the epitome of sacredness, including the Tetons. 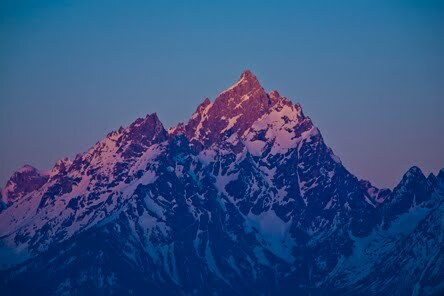 This group of the Tetons is known as the Cathedral Group. Enjoy. 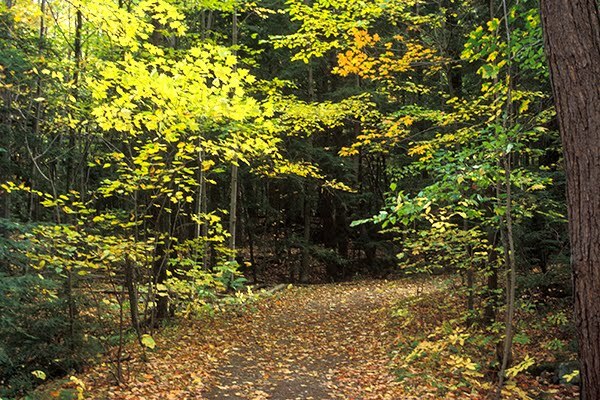 Join Us for a Relaxing Autumn Weekend in New England! The renowned Kripalu Yoga Center in Lennox, MA has invited me to do a weekend retreat Oct 28-30th based on my bestselling book, Stand Like Mountain, Flow Like Water. If you have an interest is unplugging from your fast-paced lifestyle and finding your center of balance, come join us in the beautiful and relaxing Berkshires mountains this October. Kripalu has even secured some CE’s as well. The Earth Songs documentary film will be screened on Sat night, too. Below are two links with more contact information. Hope to see you in October. A New England road less traveled, taken when I lived in Vermont many moons ago. Enjoy! Why is fiber (also known as roughage) so important? Fiber (cellulose tissue that cannot be digested) acts like a broom that cleans out the gastro-intestinal tract. As such, it helps flush out cholesterol, and various other substances (and toxins) that might otherwise be absorbed into the bloodstream. Fiber, it is believed, is the first line of defense in regulating blood sugar levels. The Standard American Diet (SAD) is filled with empty calories (and little fiber). The goal of each meal is to eat nutrient-dense foods, lots of fruits and veggies and only a small portion of protein. While the premise of the book, The Chine Study, promotes veganism (not necessarily the intent here), the message here is that we all need to eat more fiber in our diets, regardless. Foods high in fiber include fruits and veggies (broccoli, carrots, kale, cabbage, and many legumes (garbanzo beans, black beans, kidney beans, etc.) and whole grains (such as quinoa) etc.). By no coincidence, these same foods contain a host of vitamins and minerals necessary for optimal metabolism. So what’s for dinner tonight? Think fiber! Eat Fiber! Like every diet book, there are advocates and critics. Here are two links, one of each as well as the book title itself. Campbell, C., The China Study: The Most Comprehensive Study of Nutrition Ever Conducted and the Startling Implications for Diet, Weight Loss and Long-Term Health. 2005. 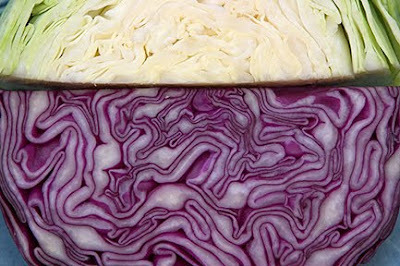 As part of a slide show I put together, called The Low Stress Diet, I went to Whole Foods one day and purchased a few bags of produce, including some cabbage for a photo-shoot. Afterward, I had one tremendous meal. Enjoy! worked-up over a software malfunction. 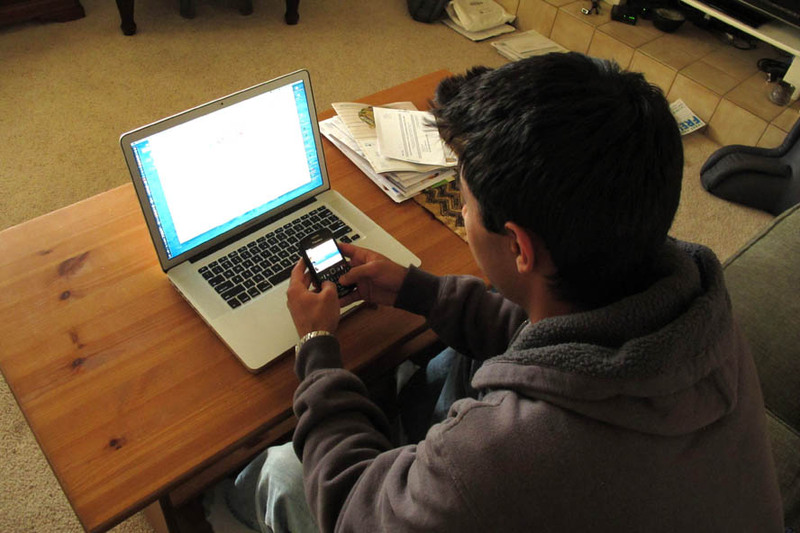 In what could have been an easy solution soon became a series of frustrating tech support phone calls (lasting days), which only compounded his frustration no end. The expression, “Do you want to be right or do you want to be happy” came to mind several times. Creative problem solving is one of the most empowering techniques in stress management, because it enables the individual to stop spinning one’s wheels and move on. The biggest impediment to the creative process is the ego, which can either override any idea of merit, or play the “I’m right and I’ll prove it,” game. To get the most out of the creative solving process you have to step outside of the situation (also known as getting “outside the box”) to gain a sense of clarity of not only the problem, but all the possible solutions (and there is always more than one viable solution to a problem). The creative process involves several steps: (1. the search for ideas, 2, the incubation of ideas, 3) the selection of the best idea and 4) making the idea happen). The key is to do them in the right order. Call to mind a problem that has been camped out on the landscape of your mind for a while, or perhaps has appeared recently. The first step in creative problem solving begins with identifying the problem. How would a child see the problem? How would a person from New Zealand or Australia or an alien see the problem? Once you have a good fix on the issue, come up with a least four viable options as well as one zany solution (zany ideas may not be viable, but they can open the door to new possibilities.) After surveying the list of ideas, select the best one and then put your game plan into action. Remember, there is no room for ego in the creative process. 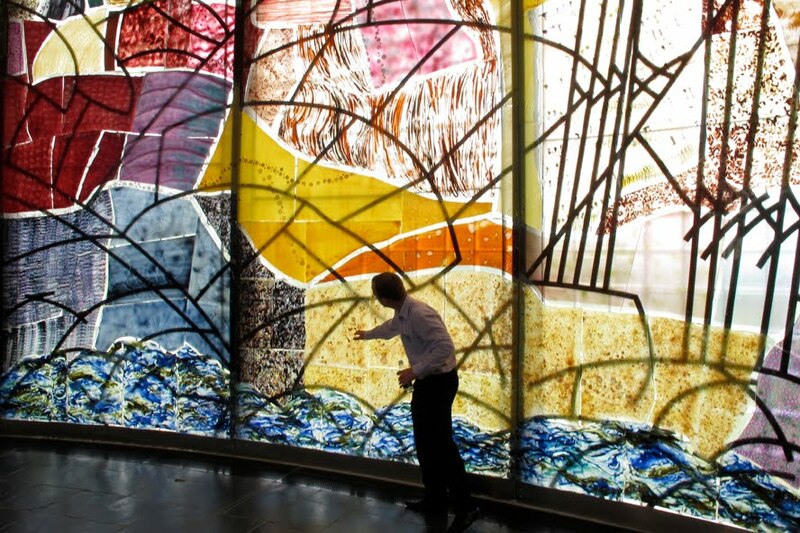 Whereas stress can be immobilizing, creativity is liberating….Be creative! Become empowered! My ultimate favorite book on creativity is Roger von Oech’s books, A Whack on the Side of the Head and A Kick in the Seat of the Pants. His Creative Whack Pack is now an App on the Apple store. 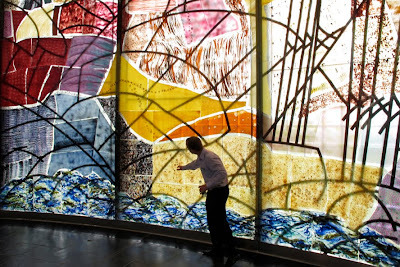 This photo is of a stained glass window located in the Blasket Island Museum on the Dingle Peninsula of Ireland, created to depict the story of the Blasket Islands visually. Enjoy!